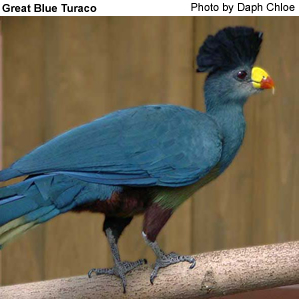 The Great Blue Turaco (Corythaeola cristata) is the largest member of the turaco family, averaging from 70-75 cm in length and weighing between 822-1231 grams. Within its range of distribution, it inhabits montane rain forests and gallery forests from sea level to around 2700m. It feeds mainly on available fruits within this environment, but the eating of leaves, shoots and flowers have also been noted.